Our journey Muang La Explorer begins in Luang Prabang, which is classified as a UNESCO World Heritage Site for its outstanding cultural, historic and architectural values: glistening temples, colonial shop houses, and soulful cafes. 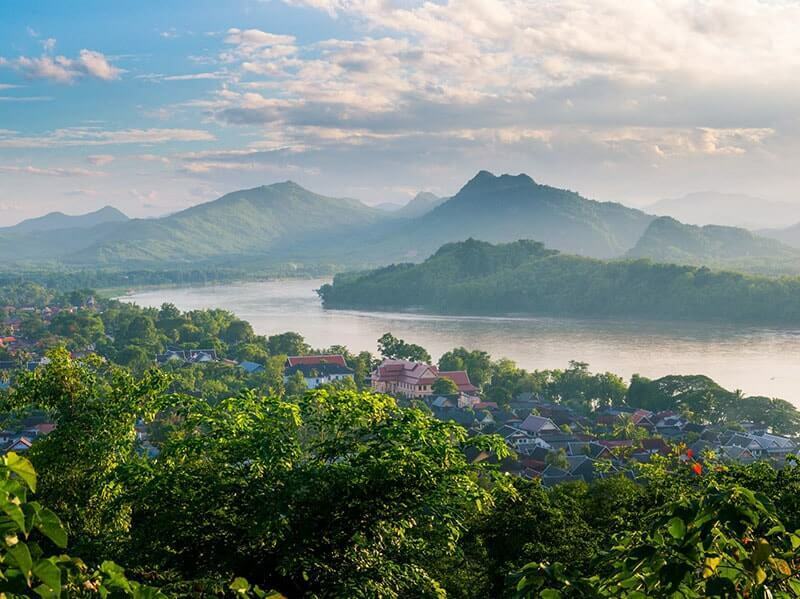 From here the journey heads to Muang La, the scenic town of Oudomxay province in the North of Laos. Then we drive to Muang Khua, to board a private long tail boat for a cruise down one of the most scenically beautiful stretches of Nam Ou river. 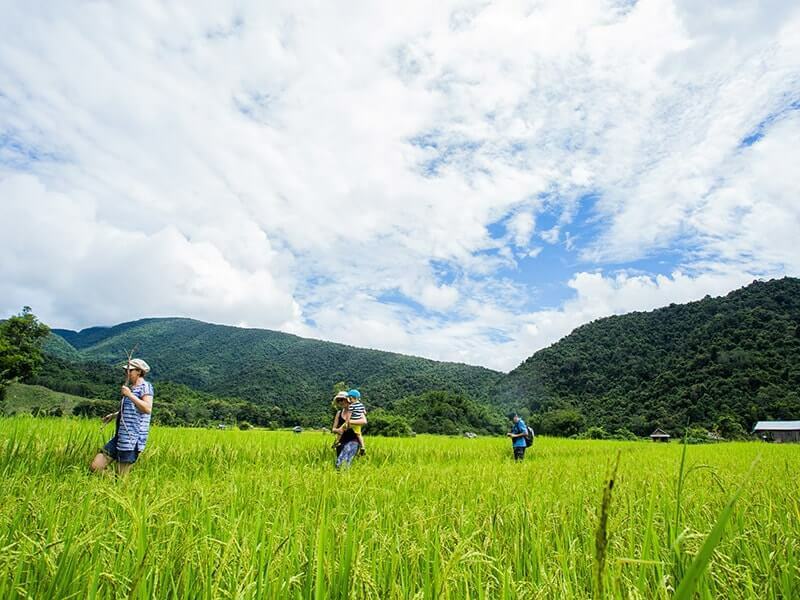 Spend one day to explore and trek at tribe villages in Muang Ngoi Neua before returning Luang Prabang. Welcome to LUANG PRABANG. Upon arrival to Luang Prabang Airport, our local guide will pick you up then transfer you to the hotel in centre of the Luang Prabang town for check in. Enjoy the remainder of the day free at leisure or explore Luang Prabang’s bustling night market, which is open daily from dusk until about 10pm. 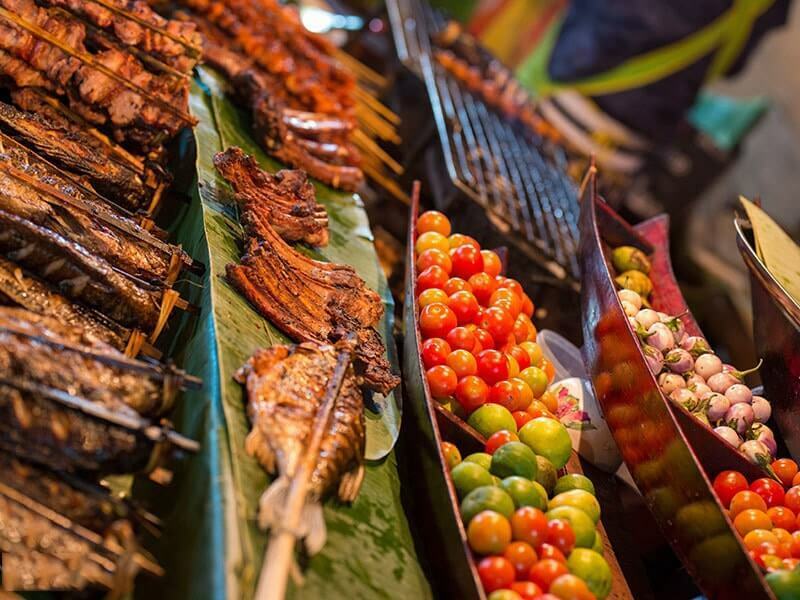 There are various of chances to taste local street food, drink the famous Laos beer and buy souvenirs for your family and friends. Wake up early for a pre-dawn experience of Luang Prabang. Begin by climbing the 328 steps to the top of Mount Phousi, getting to the top before the sun comes up. Enjoy breathtaking sunrise and panoramic views of the city and surrounding countryside. This will be one of the most unforgettable moments on this tour. Then return to hotel for breakfast. After breakfast, we continue with an interactive tour of Luang Prabang, ancient city in the north of the Laos and a delightful mix of exquisite temples and French colonial. Discover what makes this UNESCO city so unique. First, pay a visit to the former Royal Palace (now the National Museum) which was built in 1904 during the French colonial era for King Sisavang Vong and his family. The Museum hosts a range of interesting artifacts from the Royal period in Luang Prabang. 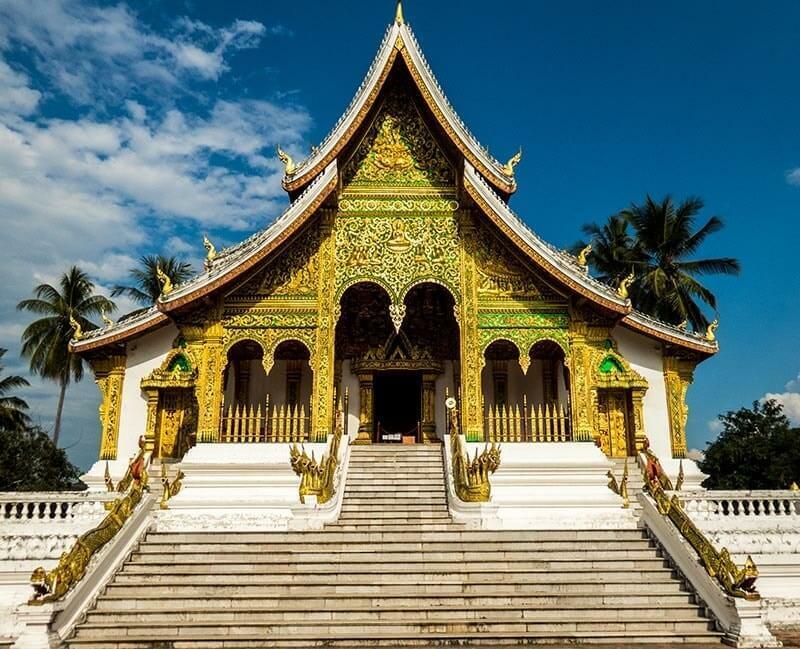 Nearby is Wat Mai, one of the largest and most richly decorated temples in Luang Prabang and Wat Sene. Next stop is the Wat Xieng Thong, one of the most important of Lao monasteries and remains a significant monument to the spirit of religion, royalty and traditional art. After lunch, continue to visit the impressive stupa of Wat Visoun (Wat Wisunarat), oldest operating temple in Luang Prabang. It was built in 1513 by King Wisunarat’s order. Afterwards, visit Wat Aham which means “Monastery of the Opened Heart” and Wat That means "the Stupa Temple" one of the most symbolic religious relics in Luang Prabang. 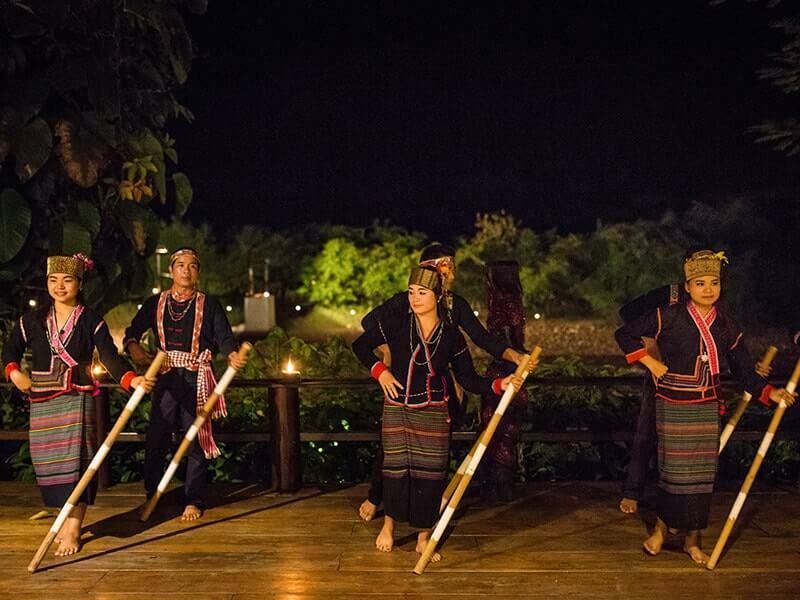 Finish our today’s tour with the Traditional Arts & Ethnology Centre, a private, non-profit museum which is dedicated to the preservation and celebration of the many ethnic minorities existing in Laos. After breakfast, we will take a transfer through the countryside of northern Laos to Muang La in Oudomxai province. Along the way, stop to visit the villages of Ban Xang Khong and Ban Xieng Lek which are located just 5 km away from central Luang Prabang. They are well known for many years in manufacturing and selling products made from silk and Saa paper (paper made from the bark of the mulberry tree). Upon arrival at the villages, you will have change to observe women use traditional methods to make paper and silk. It’s a great little spot for gift-shopping. Then continue go up north to reach the city of Oudomxai (3 to 4 hour drive) where we stop to have lunch at a local restaurant. 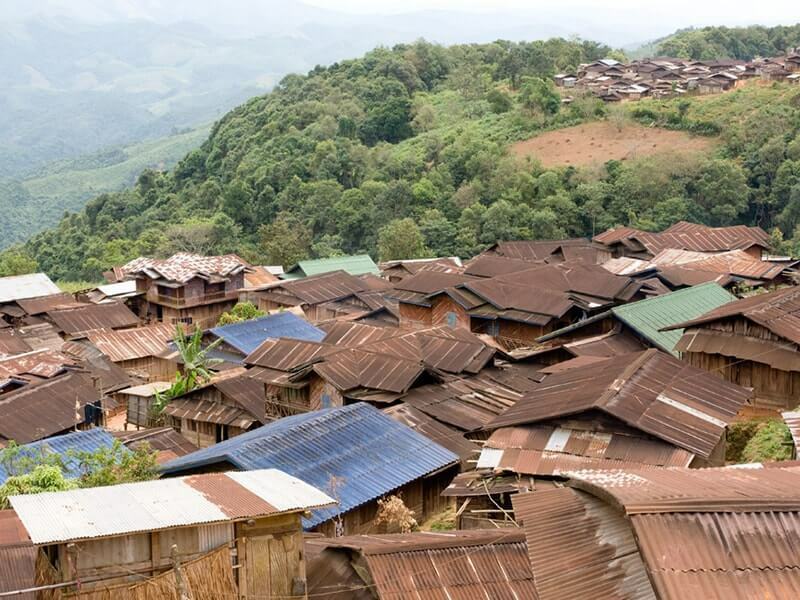 After lunch, visit tribe villages of Iko, Hmong, Akha, Khmu at higher elevations in the mountains of Muang La. Stroll through the villages, learning about the daily life of the village and how the villagers still follow customs passed down through the centuries. Enjoy the amazing, beautiful scenes surrounded mountains. Arrive in the MUANG LA in late afternoon then check in Muang La Lodge. 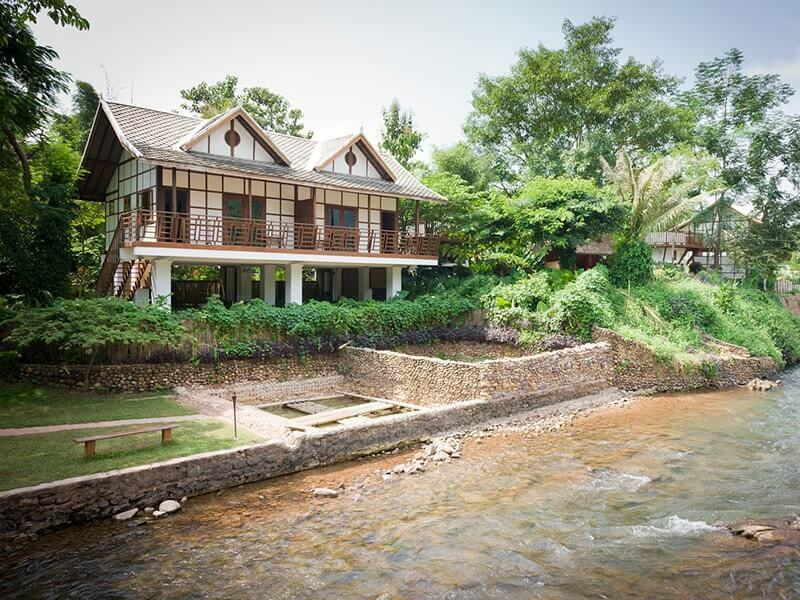 Hidden in the small village of Muang La by the river, this lodge will provides access to one of the most untouched and pristine regions of Southeast Asia. You will for sure enjoy the stay! Spend the whole day to self-explore the area around the lodge and its surrounding area. You also can enjoy the spa and massage at the lodge. OPTIONAL: If you want, we can arrange a half day of full day of sightseeing in Muang La and it surrounding area. You could choose from a variety of activities including experiencing a Baci ceremony, ethnic village trekking, caves exploring, visiting local villages at the surrounding area of Muang La with our guide on a bike or van tour. 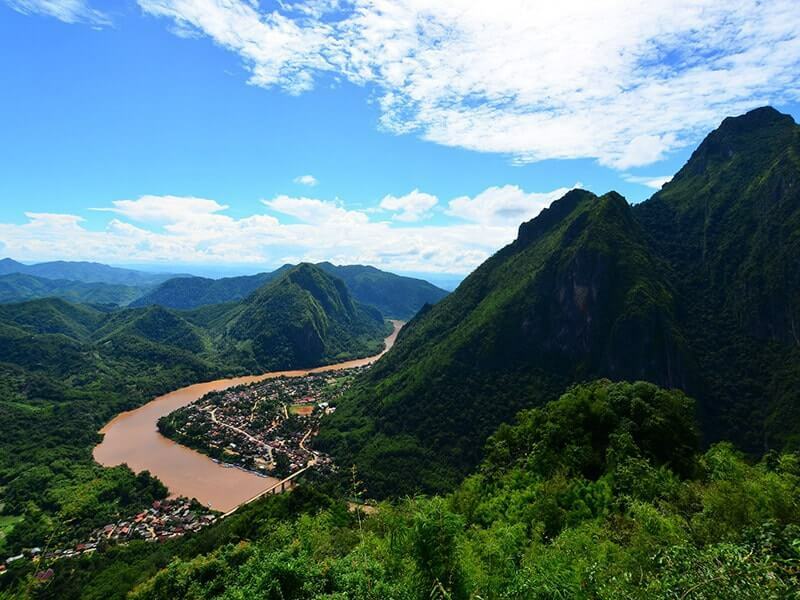 Today, drive to MUANG KHUA, a small town in the Phongsaly province of northern Laos. Follow the main road towards Phongsaly while crossing rolling hills; the road leads eventually to Tay Trang Border with Vietnam. The drive takes approximately 2 hours. Upon arrival Muang Khua, board a private long tail boat for a cruise down one of the most scenically beautiful stretches of Nam Ou river. It takes nearly four hour, cruising slowly between the white limestone rocks of the mountains that border the river right and left. On the way, you could see lush green subtropical forests, water buffaloes and pigs lazing and grazing on the sandy riverbanks. Villagers, children and fishermen are waving at you. Enjoy your picnic lunch along the way while cruising downstream. In the afternoon, reach the destination of MUANG NGOI, a place to unwind and reset your soul. Disembark and check in to a local guesthouse. Have dinner at the local restaurant and relax. After the breakfast, leave Muang Ngoi and begin 2 hours of trekking through the rice field and beautiful landscape to Ban Houay Sens village. On the way, stop to explore Tham Kang, Tham Gang and Tham Pha Keo Caves, which are located about 30 minutes from Muang Ngoi. These caves were used as bomb shelters during Vietnam - America war. They are several kilometers in length with waterfalls and rock formations. Our guide will give you information to help you better understand about ethnic groups in Northern Laos such as Hmong and Khmu minorities. After that, trek back to Muang Ngoi. Lunch will be served at a local restaurant in Muang Ngoi. Take a short break then float downriver to NONG KHIAW by boat. Check in then free at leisure. Free at leisure until our guide transfers you back to Luang Prabang by private car. 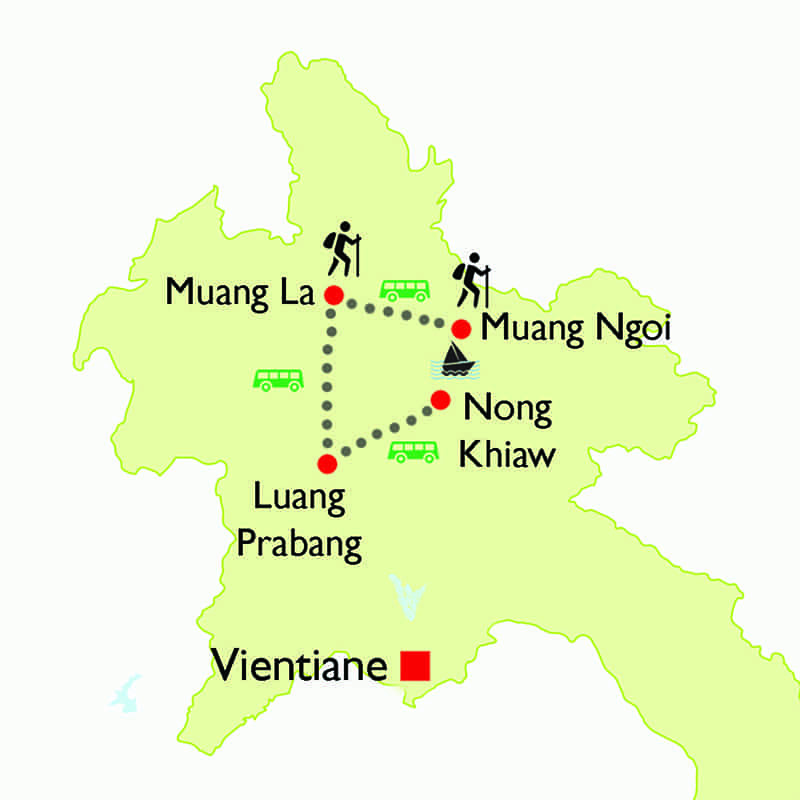 It will takes approximately 3 hours to drive from Nong Khiaw to Luang Prabang. Wander around this beautiful town before be transferred to Luang Prabang airport for your onward flight.